Moments ago, inside of the Barclays Center in Brooklyn, New York, WBC super middleweight champion Badou Jack and IBF super middleweight champion James DeGale fought to a 12-round majority draw in front of a lively crowd. The fight has been long-discussed and the anticipation was heavy heading into Saturday night; both men showed great flashes throughout the match in what served as boxing’s first big fight of 2017. In the first round, DeGale got off to a fast start with a short left hand that touched Jack on the chin and dropped him to the floor. 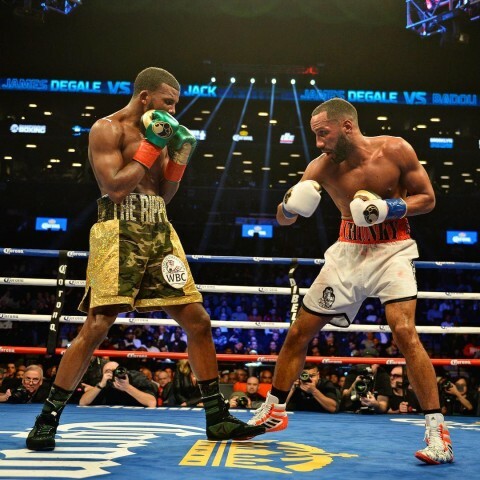 DeGale continued to build momentum in the early frames and appeared to be doing enough to edge many of the rounds. Jack began to find his groove midway through and actually started dominating several of the late rounds. A left-right combination from Jack in the 12th round dropped DeGale and the crowd erupted. Jack continued to apply pressure until the final bell tolled. Scores of 114-112 for DeGale and 113-113 twice were read, as the final verdict was a majority decision. Jack sees his record go to 20-1-3 with 12 knockouts while DeGale moves to 23-1-1 with 14 knockouts. No word on whether a rematch will take place, as Jack has hinted that he is eyeing a move to 175 pounds. Stay tuned for more post-fight coverage.